Peak Design lives up to its name. Every aspect of this bag’s construction, materials, organisation and usability feels like it’s been thought out, tested and retested. 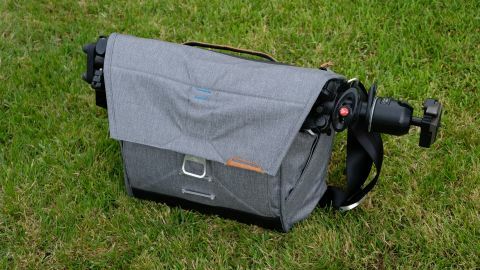 It’s not cheap, but the Everyday Messenger is smart enough for the boardroom, slim enough for the everyday commute and holds your camera gear, your computer, your bike lock and your lunch. Smart! There’s no shortage of shoulder bags for photographers out there and many have laptop compartments, but you still seem to end up swapping bags between photo expeditions and the regular office commute, because regular photo bags don’t have room for your external drives, cables, power packs, sunglasses, mints, ballpoint pens, burritos, headache pills and whatever the heck else you accumulate in your daily life. So that’s the idea behind the Everyday Messenger – it really is designed to be your everyday bag. The main compartment has two clever semi-rigid origami-inspired ‘FlexFold’ dividers for stopping your camera bodies and lenses from clonking into each other. You can fold and orientate them in a few different ways to act as vertical dividers only or to provide a semi-rigid platform for stacking and separating items of kit, and either or both can be taken out to free up the entire main compartment for paperwork, product samples, dinner, a spare sweater or whatever else you need that day. Your laptop slides snugly into a separate zippered compartment at the back of the bag, but make sure you get the right size – the Everyday Messenger comes in both 13-inch and 15-inch versions. That rear compartment has a divider so that you can put in a tablet too, without the two scratching against each other. Having a separate compartment for your laptop makes it much more accessible in the confined space of a train or a bus and means you’re not showing a bunch of strangers your massively expensive camera kit. As for all your daily paraphernalia, this can go in a separate expanding pocket at the front of the bag, with elasticated compartments for holding external drives, cables, pens, memory cards and more. You can pack this pretty full and the bag will keep on swelling to accept it. That’s because of its MagLatch closure system. You hook the catch on the lid into one of a series of ‘ladder’ catches. The fuller it gets, the further up the ‘ladder’ you go. If you stuff it too far, though, and fill every other handy nook and cranny the Everyday Messenger offers, it soon becomes unwieldy. This emphasis on design pays dividends in a whole bunch of other neat touches. There’s a zipper in the lid for quickly gaining access to the main compartment and it opens wide enough for you to easily get your hand in and a camera out. There are stabilising straps that go across your chest or around your waist if you need to do any clambering or running, and they tuck away neatly out of sight when you’re not using them in unobtrusive side pockets which will also hold a phone or other small-ish items. There’s another long, shallow padded pocket in the main compartment for more casual storage. Need to take a tripod? On the inner surface of the lid is a tough tubular sleeve which you can slide a tripod leg through, and behind it is a long zippered compartment that contains a silicone strap for securing that leg to the others when you’ve done it. For small to medium tripods, it’s a brilliant solution. The Everyday Messenger is a really clever bag that’s versatile enough to genuinely be your everyday bag, and packed with clever design touches for those who really appreciate these things. It’s expensive, but you really do feel you’re getting your money’s worth. The only nagging doubt is those FlexFold dividers. You could go round in circles trying to find the ‘perfect’ arrangement, and they don’t have thick puffy padding to hold your gear in tight.